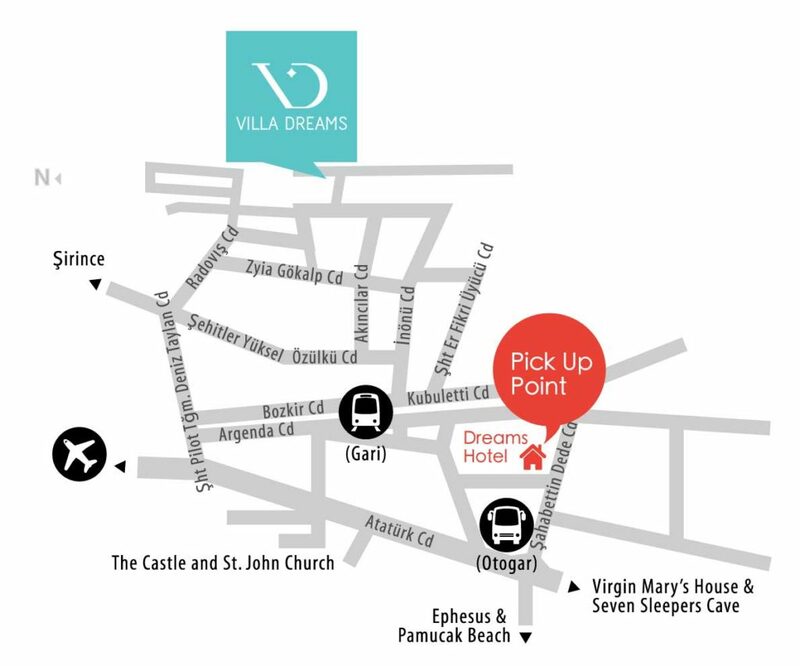 Our free shuttle runs between VILLA DREAMS and DREAMS HOTEL (DREAMS GUEST HOUSE), which locates right in the town, where you can find restaurants, bars, supermarkets and shops. It is just 1 minute walk away from the bus terminal and 5 minutes from the railway station. Please arrive 10 mins before the departure time and let us know you are going to take the shuttle. We provide shuttle service other than the running times for special conditions only, we can arrange taxi for you if shuttle is not available. We accept special requests for shuttle to/from the railway station or bus terminal for the customers arrival or departure during our service hours. Please call us at +90 (545) 379 5210 when you arrived Selcuk for the arrangement. We do not provide free shuttle to/from the airport or any tourist attractions. We can provide information about transportation and arrange private transfer for you. Please fill up our contact form or call us at +90 (545) 379 5210 for inquiries.